If you add a 3D model to a 3D scene, it is added as a 3D object. It can be transformed and animated in a 3D stage, rotated in any direction and scaled on any axis. You can also reposition the model's sub-objects, and even separate them so as to be able to animate them separately. A 3D model in a 3D scene is linked to the model in your 3D Models library. This means that you can replace the model in your library, and by doing so, replace it in every panel in which the model was added. If you import a 3D model to a 2D scene, you can choose to either render it as a 2D layer or to convert the scene to 3D so it can be added as a 3D object. In the latter case, the camera as well every layer in your scene will be subject to 3D transformations and animations, not just the 3D model. Although a 3D scene is more flexible, having 3D controls over every element in your scene just because you have a single 3D element in it may be burdening. If you prefer, you can render your 3D model into a flat drawing layer. This will not give it the flexibility of a 3D object, but will preserve the 2D property of your scene and keep your workflow simple—see About Adding 3D Models to 2D Scenes. 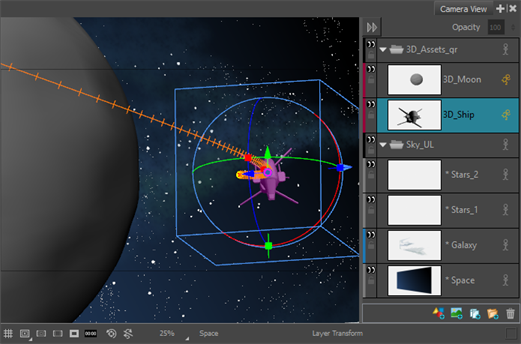 You can also convert a scene to a 3D scene without importing a 3D model in it, allowing you to make 3D transformations on its drawing layers—see About Staging in 3D Space.